2 June 2008, at 11:36a.m. US – US agricultural exports are expected to reach a record $108.5 billion for fiscal year 2008, according to the US quarterly forecast for. The upward revision is a $7.5 billion increase from February's previous record forecast and $26.5 billion above the final 2007 exports. Grains and animal products account for two-thirds of the export gains. 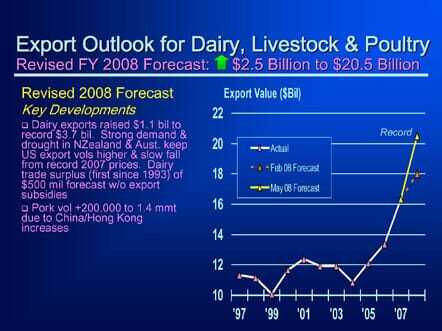 Exports of livestock, poultry, and dairy products are forecast at $20.5 billion in fiscal 2008, up $2.5 billion from the February forecast. The improved outlook for dairy products to a record $3.7 billion accounts for nearly half this adjustment, while pork and broiler meat account for much of the rest. Dairy prices remain higher and demand is stronger than expected. Drought in Australia and New Zealand has persisted, keeping global supplies tight and unit values from falling as much as expected from record highs in 2007. US nonfat dry milk export volume and unit value have increased, and this product should account for about 40 per cent of US dairy exports this year with Mexico as the largest foreign market. Cheese, whey, and butter fat collectively account for another quarter of US sales with strong demand from many countries. Pork sets new export volume and value records. Pork exports are raised about $475 million from the February forecast on a 200,000-ton increase, largely due to increased sales to China. Increased sales are supported by catering business for the Olympics, rising incomes, and reduced domestic supplies resulting from disease outbreaks and weather. "America's increased export volume in bulk commodities like corn, other animal feeds and soybeans make agriculture the bright spot in the overall balance of trade," said Agriculture Secretary Ed Schafer. "US producers are on track to export a record 63 million tons of corn, and set new export volume and value records for pork. Export volumes and values are also up for many horticultural products with sales growth to Canada and the European Union being exceptionally strong." Asia continues to be an important growth market for US agricultural commodities. US exports to China are forecast to reach a record $10.5 billion, up almost $3.4 billion from 2007 levels. Canada and Mexico remain the United States' top two markets worldwide with exports forecast to reach $30.5 billion in 2008 – some $5 billion above 2007. "Trade agreements have a significant impact on our ability to sell America's agricultural products in world markets," said Mr Schafer. "Canada and Mexico, our two North American Free Trade Agreement (NAFTA) partners, currently buy 28 percent of the value of America's agricultural exports – up from 20 percent purchased 15 years ago when trade began under NAFTA. Unfortunately, Congress has not been acting in the best interest of the American farmer and rancher by stalling approval of the signed trade agreement with Colombia, yet along with approving trade with Korea and Panama, Congress could provide three extremely important markets for expanding the trend of increased American export sales for years to come." While agricultural imports in two-way trade with the United States will also increase – to a record $78.5 billion forecast by USDA – the $108.5 billion in export sales by American farmers and ranchers will net a positive agricultural trade surplus of $30 billion for the United States. USDA's Economic Research Service, Foreign Agricultural Service and World Agricultural Outlook Board release agricultural trade forecasts quarterly. The summary and full report of USDA's "Outlook for US Agricultural Trade" may be accessed from the ERS web site at http://www.ers.usda.gov or the FAS web site at http://www.fas.usda.gov . The next quarterly report will be issued at the end of August 2008.